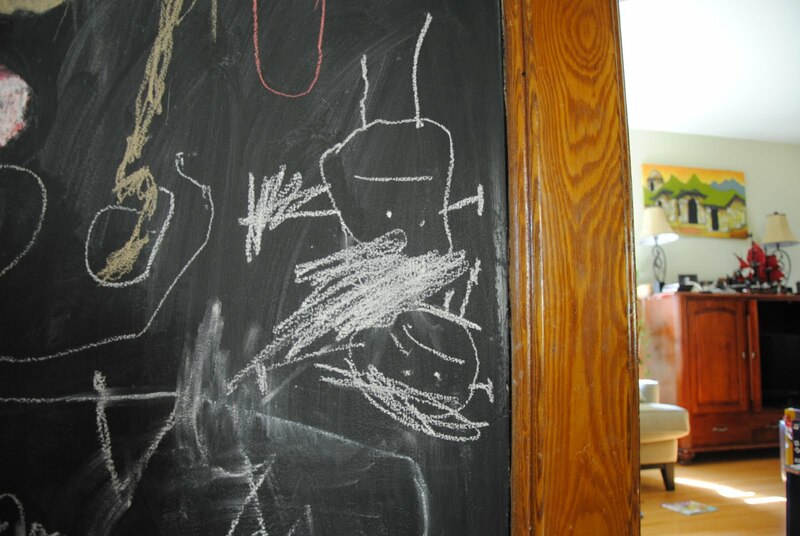 **This is CJ’s drawing of the two of us. Yes, we’re upside-down. He’s the one standing on my head. Today, I am feeling the effects of less sleep; it seems like there’s always a grace period after sleep-deprivation, followed by a crash. I’m in crash mode today, and hoping for recovery by tomorrow. Yesterday, during the grace period, I burned through a crazy variety of activities while still flush from the after-effects of witnessing a birth. I napped in a dark room for two hours. I spent the afternoon with CJ. I made supper and vacuumed the house because the floor was nothing but crumbs. I packed a picnic for my soccer girl. I got ready for swim lessons, got kids snacked, changed, and to the pool, and then went for a much-needed run in the park across from the pool. It was gorgeous and sunny and I would have run and run and run had the kids not been waiting for me. I got back to the pool just in time, got kids showered and changed, raced home to put supper on the table, grab a bite to eat myself, and feed soccer girl. We had less than half an hour to transition to the next activity: a soccer coaching clinic. Turns out Kevin and I are coaching all three of our kids’ indoor soccer teams (CJ isn’t old enough to be on a team, or no doubt we’d have managed to sign ourselves up to coach four). We’re not even sure how it happened. But Kevin is working quite a few Saturdays, which means that I will need to be there if he isn’t (with extra kids in tow? we haven’t worked out the finer details), so off AppleApple and I went to the coaching clinic. The coach leading the clinic is also coaching the U-10 rep girls team, so he had the girls come out to demonstrate. It was a pleasant stroke of luck that as part of the coaching clinic I also got to watch my soccer girl in action. We spent three full hours at the indoor field, the last hour of which was just a great big game. The girls played, the rep coaches played, and the parent volunteers who had signed up to coach their children’s teams were invited to play, too. Only a few dads jumped in. I was one of two or three moms volunteering to coach, and we all passed. I was invited to join the game! And I stood on the sidelines instead. I was tired, yes, but that wasn’t why I didn’t play. I was chatting with a friend, but that wasn’t why I didn’t play either. It also wasn’t because I didn’t want to play; I actually kind of sort of really really did want to. Nope; I didn’t play because I felt intimidated. I haven’t played on a soccer team since the age of eleven. I’ve never practiced any of the skills and techniques the head coach was showing us last night. (Excuses, excuses.) All I had to offer, therefore, was fitness and a willingness to try. Except last night, I lacked the willingness to try. Why? On the drive home, AppleApple wondered why I hadn’t played, and when I confessed to feeling too nervous and not being skilled enough, she kind of huffed and said, of course you’d be good enough! And she’s right. Because any willing participant would have been good enough. It wasn’t a test of my skills or abilities. It wasn’t about me at all. It was about running around, kicking a ball, and having fun. And those kids were having fun (so were the dads). Just look at my very own small and tough AppleApple who elbowed her way into the mix and stole the ball from the coaches and ran her heart out without once doubting that she should be there, doing that. And so, regrets? I like to think of myself as a generally unregretful person. But it turns out I have a few. Many (most?) boil down to those moments when I let pride dictate in(action). When I don’t try. When I don’t take the risk, and join the game.